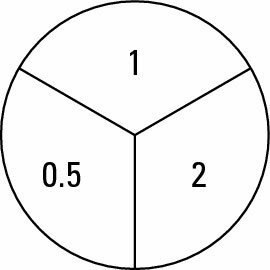 The percent circle is a simple visual aid that helps you make sense of percent problems so that you can solve them easily. The three main types of percent problems are finding the ending number, finding the percentage, and finding the starting number. The trick to using a percent circle is to write information into it. For example, the following figure shows how to record the information that 50% of 2 is 1. Notice that as you fill in the percent circle, you change the percentage, 50%, to its decimal equivalent, 0.5. These features are the heart and soul of the percent circle. They enable you to solve any of the following three types of percent problems quickly and easily. Most percent problems give you enough information to fill in two of the three sections of the percent circle. But no matter which two sections you fill in, you can find out the number in the third section. What is 75% of 20? You’re given the percent and the starting number and asked to find the ending number. 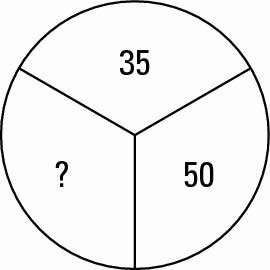 To use the percent circle on this problem, fill in the information as shown in the following figure. So 75% of 20 is 15. As you can see, this method involves translating the word of as a multiplication sign. You still use multiplication to get your answer, but with the percent circle, you’re less likely to get confused. What percent of 50 is 35? In this case, the starting number is 50 and the ending number is 35. 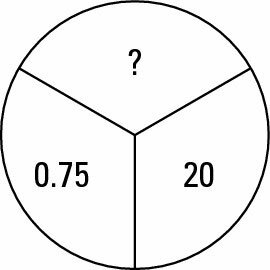 Set up the problem on the percent circle as shown in the following figure. 15% of what number is 18? 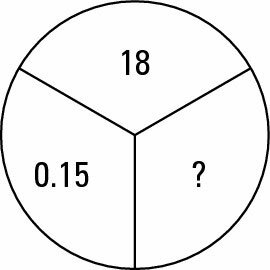 This time, the percentage is 15% and the ending number is 18, so fill in the percent circle as shown in the following figure. In this case, the “decimal” you find is the whole number 120, so 15% of 120 is 18.